"During his boyhood his life was attempted by plots on the part of his guardians, who, mounting him on a restive horse, forced him to ride and hurl the javelin; but when these attempts failed, as his management of the horse was superior to his years, they tried to cut him off by poison. He, however, being on his guard against such treachery, frequently took antidotes, and so fortified himself, by exquisite preventives, against their malice, that when he was an old man, and wished to die by poison, he was unable." King of Pontus on the southern shore of the Black Sea, Mithridates VI (d. 63 BC) concocted one of the most well-known antidotes in antiquity (possibly with the help of his court physician Crateuas). Experimenting with different formulations and trying them out on condemned prisoners, he compounded various antidotes to produce a single universal one, which he hoped would protect him against any poison. A hundred years after the death of Mithridates, Celsus recorded the formulation, which comprised thirty-six ingredients, all of which are derived from plants, except for honey to mix them and castor to enhance the aroma. The concoction is estimated to have weighed approximately three pounds and to have lasted for six months, taken daily in small amounts. "But the most famous antidote is that of Mithridates, which that king is said to have taken daily and by it to have rendered his body safe against danger from poison. It contains costmary 1.66 grams, sweet flag 20 grams, hypericum, gum, sagapenum, acacia juice, Illyrian iris, cardamon, 8 grams each, anise 12 grams, Gallic nard, gentian root and dried rose-leaves, 16 grams each, poppy-tears and parsley, 17 grams each, casia, saxifrage, darnel, long pepper, 20.66 grams each, storax 21 grams, castoreum, frankincense, hypocistis juice, myrrh and opopanax, 24 grams each, malabathrum leaves 24 grams, flower of round rush, turpentine-resin, galbanum, Cretan carrot seeds, 24.66 grams each, nard and opobalsam, 25 grams each, shepherd's purse 25 grams, rhubarb root 28 grams, saffron, ginger, cinnamon, 29 grams each. These are pounded and taken up in honey. Against poisoning, a piece the size of an almond is given in wine. In other affections an amount corresponding in size to an Egyptian bean is sufficient." Pliny (Natural History, XXIX.25) attributes to Mithridates another antidote with fifty-four ingredients and remarks that the king drank poison daily after first taking remedies to achieve immunity (XXV.6-7). He also experimented with antidotes derived from the blood of Pontic ducks, which, says Pliny, suffered no harm, even though they were supposed to live on poisonous plants (cf. Aulus Gellius, Attic Nights, XVII.16). When Mithridates was defeated by Pompey, a notebook was found in the king's own hand with a prescription for an antidote which consisted of only two dried walnuts, two figs, and twenty leaves of rue pounded together with a pinch of salt (Natural History, XXIII.149). Among the other papers was detailed information on medicinal plants, together with specimens and notes on each, all of which Pompey had translated into Latin (XXV.7). To avoid capture, Mithridates tried to poison himself. (His wife and children, who were poisoned first, died readily enough.) But his resistance was such that the poison had little effect. "Mithridates had tried to make away with himself, and after first removing his wives and remaining children by poison, he had swallowed all that was left; yet neither by that means nor by the sword was he able to perish by his own hands. For the poison, although deadly, did not prevail over him, since he had inured his constitution to it, taking precautionary antidotes in large doses every day; and the force of the sword blow was lessened on account of the weakness of his hand, caused by his age and present misfortunes, and as a result of taking the poison, whatever it was. When, therefore, he failed to take his life through his own efforts and seemed to linger beyond the proper time, those whom he had sent against his son fell upon him and hastened his end with their swords and spears. Thus Mithridates, who had experienced the most varied and remarkable fortune, had not even an ordinary end to his life. For he desired to die, albeit unwillingly, and though eager to kill himself was unable to do so; but partly by poison and partly by the sword he was at once self-slain and murdered by his foes." Florus, too, has Mithridates ending his life by the sword, one "which he had in vain tried to destroy with poison" (Epitome of Roman History, I.40). Other accounts have the king die by his own hand (Attic Nights, XVII.16) or by that of a trusted soldier (Appian, The Mithridatic Wars, XVI.111), complaining "Although I have kept watch and ward against all the poisons that a man takes with his food, I have not provided against that most deadly of all poisons, which is to be found in every king's house, the faithlessness of army, children and friends." Pliny (XXIX.24-25) was skeptical of theriacs such as Mithridatum, with their countless ingredients. And, indeed, some proportions are so slight in quantity as to raise doubt as to their benefit or even the ability to measure them. "The Mithridatic antidote is composed of fifty-four ingredients, no two of them having the same weight, while of some is prescribed one sixtieth part of one denarius. Which of the gods, in the name of Truth, fixed these absurd proportions? No human brain could have been sharp enough. It is plainly a showy parade of the art, and a colossal boast of science." And yet an examination of the pharmacology of Mithridates' original formulation shows a conscious effort to select plants thought to be useful, many of which have a strong scent and are from the family Apiaceae: Cretan carrot, assafoetida ("gum"), galbanum, sagapenum, opopanax, parsley, anise, hartwort ("saxifrage")—all of which, in fact, do reduce inflammation. Theriacs continued to be used in England until the eighteenth century, when a treatise by William Heberden in 1745 discredited their efficacy. The next year was the last in which the London Pharmacopoeia listed them. In Germany and France, however, theriacs appeared in the national pharmacopoeias for more than another hundred years. This selection comes from A Shropshire Lad, a larger collection of poems by Houseman, who was better known, until its publication in 1896, as a respected scholar and professor of Latin. Regrettably, Antidotes and De Theriaca ad Pisonem, in which Galen relates how Mithridates compounded his epynomous theriac, are not available in English. Galen, who was physician to Marcus Aurelius, also created his own antidote, which he called theriac, the original meaning of the word "treacle," as in Venetian treacle, where it had been manufactured according to a strict formulary since the twelfth century. Galen also preserves the theriaca of Andromachus, physician to Nero. Comprising fifty-seven ingredients, including the flesh of a viper (on the assumption that the animal is immune to its own venom), Galene was said to have been used every day by Aurelius. 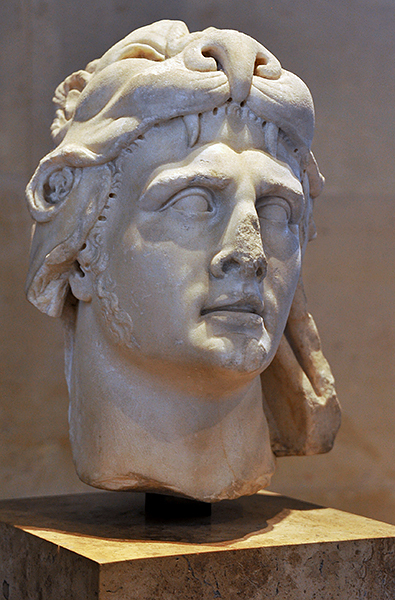 The bust of Mithridates as Hercules is in the Louvre (Paris). References: Theriac and Mithridatium: A Study in Therapeutics (1966) by Gilbert Watson; Marcus Junianus Justinus: Epitome of the Philippic History of Pompeius Trogus (1853) translated by the Rev. John Selby Watson; Dio Cassius: Roman History (1914) translated by Earnest Cary and Herbert B. Foster (Loeb Classical Library); Pliny: Natural History (1938-) translated by H. Rackham et al. (Loeb Classical Library); Florus: Epitome of Roman History (1929) translated by Edward Seymour Forster (Loeb Classical Library); Appian: Roman History (1912) translated by Horace White (Loeb Classical Library); Aulus Gellius: Attic Nights (1927) translated by John C. Rolfe (Loeb Classical Library); "The Pharmacology of Mithridatum: A 2000-Year-Old Remedy" (2006) by Stata Norton, Molecular Interventions, 6(2), 60-66; "Venetian Treacle and the Foundation of Medicines Regulation" (2004) by J. P. Griffin, British Journal of Clinical Pharmacology, 58(3), 317-325.